Read on Miss and Mrs Multiverse International 2013 Official Finalists. Exciting year for Miss and Mrs Multiverse International 2013 Official Finalists is about to unleash in Punta Cana The Dominican Republic. This place is considered as the most luxurious beach resort in the country. The Miss & Mrs. Multiverse International 2013 will start their pageant feat from November 8 until November 17, 2013. Multiverse beauty pageant Official finalists will give their very best to bring home the title. Miss and Mrs Multiverse International 2013 Official Finalists are excited to experience the coronation night on November 17, 2013 in Punta Cana The Dominican Republic, for this high class event will only provide international delegates with the most luxurious beach resort, the top touristic spot of the caribbean and the best event and production crew surrounding Multiverse official finalists. Miss Multiverse delegates; ages 17 to 26, she can never been married and has no children. Mrs. Multiverse delegates; ages 20 to 35, she can be single, married, divorced, widowed. She is allowed to have children but this is not necessary. 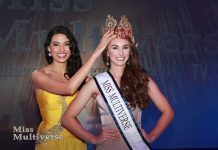 Prestigious Beauty Pageants website is enthused to highlight various international pageants and it offers annual and special spotlight of different prestigious beauty pageants around the globe. Next articleKazakhstani declared one of the most beautiful married woman in the world.